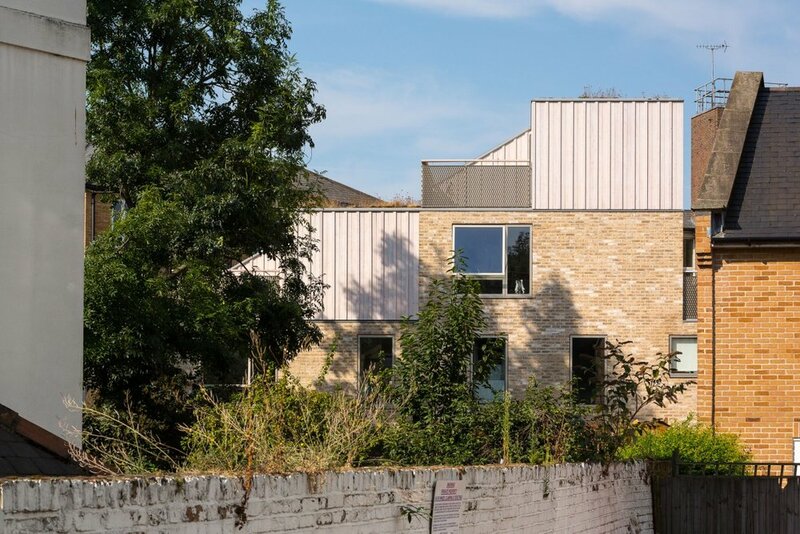 Church Walk provides 4 great homes within what seemed an unpromising urban site. David Mikhail and Annalie Riches purchased the land at auction in 2005, acting as developer and architect. It was only 21mx10m, and significantly overlooked at the back. In this difficult context, the design sought to make memorable housing at high density whilst being neighbourly. The project uses wood throughout; as structure, cladding, flooring, staircases, and internal joinery, and is an essential part of its identity. The building contains two three-bedroom houses, a three-bedroom flat and a one-bed flat, significantly more accommodation than the planning permission the site came with. This added value has helped pay for good quality materials. Floor levels and ceiling heights have been carefully manipulated throughout to maximise accommodation. Where some rooms such as bathrooms and bedrooms have minimal ceiling heights, others have hugely generous double height spaces. The plans were developed with a triangular shape at the back in order to avoid overlooking and being overlooked by neighbours. The rear windows are only ever on the side of the triangle perpendicular to neighbouring windows. The scheme also steps down to be only 2m high in the southern most corner, minimizing loss of daylight to existing ground floor windows. The building heights have been closely calibrated using the BRE Guide to Sunlight and Daylight. There are several outdoor spaces to enjoy, with courtyard gardens at the rear and three generous terraces oriented south which provide an elevated place to enjoy the southerly views down the street towards the City. The planted wildflower roofs ensure privacy between each terrace. External materials are light in tone to help minimize any sense of being overbearing: white oiled Siberian larch is arranged board on board; buff coloured brick is set in a flush white lime mortar to give an homogenous ˜cast” feel to the street facade. Brickwork recalls the ubiquitous London stocks of 19th Century London. A large gauge expanded aluminum mesh shimmers in the sun and offers a degree of transparency. ˜Velfac” windows, which are a composite of aluminium and timber, are finished to match the expanded aluminium mesh in an anodized bronze. At the rear, brick gives way to a much softer and lighter feel, with the white-oiled Siberian Larch taken right down to low brick plinth walls. In the rear gardens, hazel hurdles made by friends from a Kent woodland are strung between stainless steel wires to form garden fences. Internally the theme of whitened wood and muted shades continues using Douglas fir. Instead of the ubiquitous minimal detailing of shadow gaps, a more robust traditional architectural language is used. Doors are veneered D/Fir. D/Fir Architraves and linings are provided around all door openings. Window reveals and sills are lined in D/Fir, whilst extra tall skirting boards come up to meet the window sills (400mm). The floors are generally wide plank D/Fir with a soaped white finish. Staircases are solid D/Fir, made in the contractor’s workshop and constructed on site.